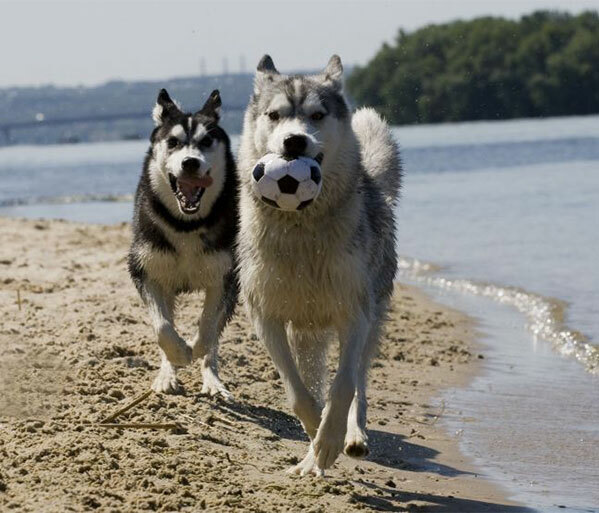 Commonly asked questions about the Siberian Husky breed. No, they are no more wolf than a Beagle. Aren't all Huskies black and white? 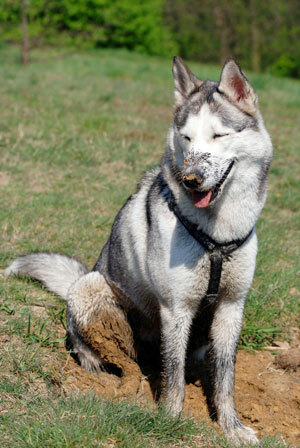 No, Huskies can be any color, from solid black to solid white and any combination in between. They are truly rainbow-colored dogs. Don't all Siberian Huskies have blue eyes? No. Some do have two blue eyes, others have one brown and one blue eye (this is referred to as "bi-eyed"), and others have one eye with a brown or blue "chip" (this is called "parti-eyed"). Any combination of colors is acceptable and none are preferred over the other. Of greater importance is the health of the eyes themselves, and a reputable breeder will provide you with proof that both sire and dam have been declared free of genetic defects such as cataracts, usually performed by a certified canine ophthalmologist. No. this is called a "pinto eye," a "parti-eye," or a "split eye." It is fairly common in the breed. One or both eyes may be all blue with a brown pie-shaped wedge, or all brown with a blue wedge. At first glance, it may appear that there is something wrong with the eye but there is not. It is simply a matter of pigmentation. This too is perfectly acceptable in the breed. This is called a "snow nose." The black pibkent lightens during the winter months. It goes away when there is more sunlight, as in the summer months. I've heard that Siberians are stupid. Is this true? No, they are not stupid. They tend to be more independent than other breeds, which may be construed as stupid or aloof. I have heard that Siberian Huskies are a very aggressive breed. Is this true? No, they are dogs that were bred to work in teams; therefore, working together, cooperating and getting along are necessities. They are not fighting dogs; quite the contrary, they are very friendly dogs. How do I know if it's the right breed for me? Do your homework: read a few books, research on the web, talk to others who have had Huskies. Yes, Siberians are beautiful, but they do have some characteristics that you should be aware of when comtemplating your decision. For example, some like to dig, while others can be escape artists. They all shed copious amounts of fur occasionally. If you honestly think you can deal with these factors, a Siberian might be right for you and your family. Should I get a male or a female? Is one better that the other? We don't feel that one is better than the other. It is a personal preference. 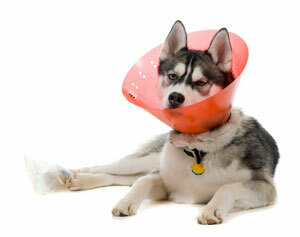 A neutered male has about the same characteristics as a spayed female. Non-spayed females have a heat cycle twice a year, at which time they must be guarded against unwanted pregnancy. Intact males will lift their legs and mark things; they are also always in search of females in season. For a number of reasons, we strongly feel that people who are not reputable breeders spay and neuter their dogs. Are Siberian Huskies good with children and other animals? Yes, if they are raised and socialized properly when young—just like any other breed. Can't I just let my Husky run, and he will come back when he is ready? No, we cannot stress this enough—Siberian Huskies must never be trusted off leash. If you just let your Husky run, he or she will likely not come back or just go home with someone else. We have heard of too many dogs being hit by cars because they were allowed to run off-leash. I live in a very hot climate; can I still have a Husky? Sure! They just won't grow as heavy a coat as in a northern climate. As with any other type of dog, be sure not to leave a Husky outside in the heat without shade or water. Huskies' coats act as barriers against the heat; many Huskies live in Texas and in other states with hot climates, and will get used to the heat just like humans acclimate themselves. How can I help my dog safely survive the holidays? Don't leave food unattended on tables and counters where your dog can reach these tasty morsels. Some dogs will take full advantage of the festivities and may ingest large quantities of human food they are not accustomed to, causing stomach upset. Unchecked, this stomach upset can lead to serious complications. Please, prevent an emergency trip to the vet and keep human food safely out of reach! Fourth of July celebrations can be fun for humans but very scary for dogs, who are very sensitive to the sounds produced by firecrackers and who may try to escape these loud noises by trying to run away. Keep your dog inside and try to retain as calm an environment as the dog is used to during this time. Tinsel can be deadly if ingested. Many curious dogs have knocked ornaments off trees or even nibbled on a few branches. If you put up a tree in your home during the holidays, especially with a young untrained dog in your family, consider putting the tree in a room you can keep the dog out of. Avoid using tinsel, glass ornaments, and other decorations that can punture or get caught up in a dog's digestive tract. During the holidays, try to maintain your dog's normal routine (for example, if your dog is used to going for a walk every evening, continue that ritual through the holidays). Dogs are creatures of habit and sometimes do not adapt well to the changes that holidays bring, such as more visitors to your home than usual. A routine will help your dog feel things are still somewhat normal during these exciting times and will help avoid stress. We STRONGLY recommend the use of a crate, as both a training tool and a safe haven for your dog. We cannot stress this enough. All of our foster dogs are crate trained, which helps accelerate their housetraining, gives them a secure place to call their own, and makes traveling with them easier. Can I trust my dog off-leash? Keeping your dog on a leash, or supervised in a closed area, is imperative. Huskies, especially, are nomads and are extremely curious. With no fear of cars and no homing instinct, a Husky that is allowed to run loose can easily become prey to serious injury, or worse. Even if your dog's recall is reliable in most instances, no dog is 100% reliable. Why take a chance? 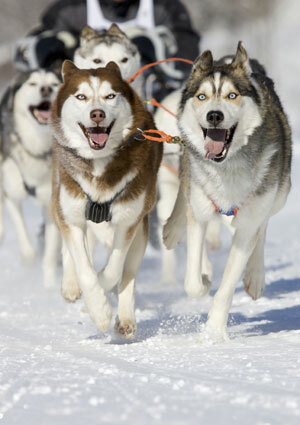 Are Siberian Huskies genetically predisposed to suffer from epilepsy? No. However, epilepsy does occur in the breed. The seizures are not life threatening, generally speaking, but if your dog does have a seizure you should have him or her checked by a veterinarian to rule out the many other possible causes. If, in the end, epilepsy is the diagnosis, seizures are usually controllable with medication (Dilantin or Phenobarbital are typically prescribed for this). Aren't Huskies genetically predisposed to suffering from blindness? No. Some Huskies suffer from juvenile cataracts and corneal dystrophy but they don't always cause blindness. These animals should be spayed and neutered so as not to pass these conditions on. Breeding animals should have an eye examination once a year. Aren't Huskies genetically predisposed to hip dysplasia? Is there ANY condition that Huskies are genetically susceptible to? When poor breeding occurs, Huskies are susceptible to all genetic defects. Most often, eyes are the main problem. A lot of inbreeding will cause cancer and other defects to occur. Is obesity a serious problem in dogs? According to an article written by Craig W. Woods, DVM, MS, obesity affects approximately 25 percent of the U.S. canine population. This staggering figure is compounded by obesity related conditions such as diabetes mellitus, orthopedic problems, cardiovascular disease, and other metabolic and physical problems. When these obesity related conditions arise, often a vicious cycle ensues requiring medical and surgical intervention. Unfortunately, intervention often comes too late in the course of the condition or lacks sufficient efficacy to arrest or deter further organ system or tissue embarrassment. Ultimately, a large portion of the obese population never returns to the quality of life enjoyed prior to the onset of the condition(s). Can the ribs be felt with gentle palpation of the sides? Is there a "waist" - an indentation in the area between where the ribs end and the hips begin (when looking down at the back)? Can the hip bones be palpated with gentle pressure? Does your pet have trouble or is your pet slow to rise or move about?